Are you among the many folks always losing your socks? Here's a simple solution to keep your socks together, so you'll always have a matching pair. After wearing, just add your socks to the SockDock®. On laundry day, throw it into the washer and dryer. 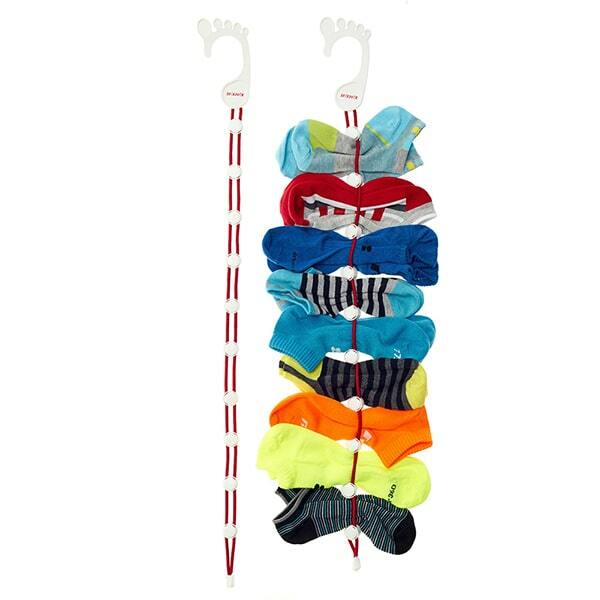 Then hang it back up in your closet – socks stay together! Space each buckle an equal distance apart, ideally while hanging on a door knob. Pull on the end of the SockDock with one hand and space out the buckles with the other hand. When the SockDock is full, remove the hanger and toss it in the washer and dryer with other laundry. Remove it from the dryer and hang it in your closet. Dimensions: 29.5" x 2.7" x 0.6"